The Union of Concerned Scientists offers some wise tips to improve your health and save energy. 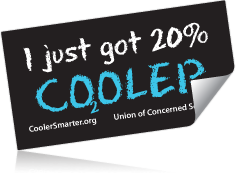 Participate in a short survey on their website and they will send you a sticker to help you start spreading the word (and letting everyone know you just got 20 percent cooler). Please note that stickers will arrive in 6-7 weeks. Ship to North American addresses only.